Fuzzorama are back with their latest split CD by two new Swedish bands. 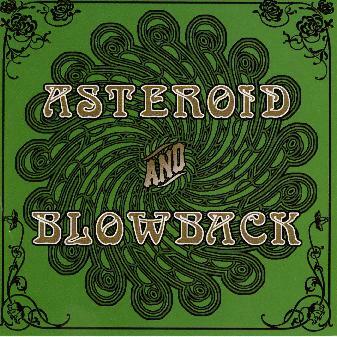 Asteroid have the first 6 tracks and Blowback the last 6. Asteroid play a very heavy fuzzed out tuned down heavy 70's inspired rock that is sometimes a bit spaced out. Supernova is an instrumental track for the first 2/3. Anagram reminds me a bit of QOTSA in a slight way. Hexagon is a cool long spacey track. Not a single guitar solo yet. Sim-Sala-Bim is the track that is apparently being played by places in Sweden and it is a slow heavy, almost doomy piece to start. The Big Trip to Beyond ends Asteroids tracks and it is quite a strange number with slow heavy parts and a strange chanting vocal like you might hear on a Gentle Giant or Focus record before the jam. Pretty cool stuff. Blowback open up with Holy Skies and also have that tuned down but slightly more clear sound than Asteroid. Autumn Leaf is next and very influenced by Black Sabbath and Trouble. Fairy's Dance kicks it up a notch and the use of the distorted vocal reminds me of some of the Trouble stuff, but no ripping guitar solos here, just riffing and some basic textured solos and a bit more spaced out sound. I like it. Cosmic Dust brings things down to a more laid back sound but still heavy and spacey when the groove kicks in. A great song. Invisible Touch ends the CD and is an all acoustic guitar track. Very nice.